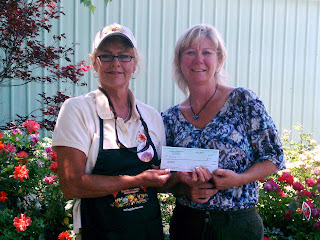 Sooz presents Shannon with a check for $410.00, the proceeds from the 2011 Garden Tour. The Club wants to express a big “thank you” to the Flower Tree Nursery for thinking of us every year with this event!! Got teeth?The Dentist Office is offering 1/2 off teeth custom teeth whitening trays.All proceeds go directly to the Fallon Youth Club…follow the link for all the details! !